The restoration work of a Victorian covered market in Preston has embraced both old ironwork and new steelwork. Martin Cooper reports. 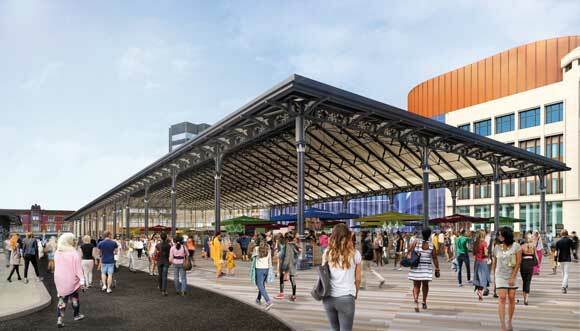 Steel tonnage: 110tPreston’s Grade II Listed Victorian Market Hall is getting a make-over as part of the city’s ambitious Markets Quarter redevelopment programme. A well-known amenity in Preston, the Market Hall was constructed in 1875 and is an open sided structure formed from cast iron columns and wrought-iron girders supporting a slated duo-pitch roof with hipped ends. The roof and all of the ironwork have recently been renovated and repainted as part of phase 2 of the redevelopment programme. The initial phase one, which was completed last year, saw the adjacent Fish Market, a smaller but similar structure to the Market Hall, renovated. Work on the interior of the Market Hall is phase three and this consists of the construction of an open topped free-standing part-glazed and part-timber clad structure situated under the renovated roof. Within this enclosure a number of new steel-framed stalls have been erected forming accommodation for 32 traders. This new structure covers approximately half of the market’s overall floor space, as the remainder of the 110m-long covered Market Hall has been resurfaced and will be used to either cater for a further 52 temporary stalls or as an events space during the evening. “The steel enclosure is designed to be structurally independent to ensure no vertical or lateral loadings are transmitted to the existing Market Hall’s historic ironwork,” explains Sanderson Watts Associates Technical Director Ryan McMullan. The new steel-framed stalls are arranged along both of the main elevations, and these are supported off the main perimeter steelwork. Meanwhile, down the middle of the Market Hall there are more free-standing island steel structures, which will accommodate further stalls. The main structural frame is typically comprised of fixed base cantilever columns, positioned at 8.1m centres along the longitudinal elevations, and 8m centres on the transverse elevations. 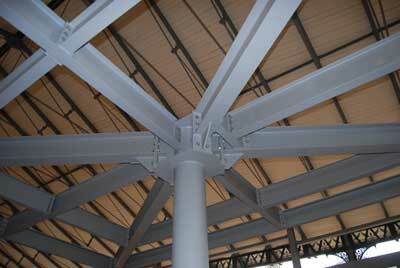 The cantilevered steel column sections are typically tapered welded plate girders on the elevations, and square hollow sections (SHS) at corner locations. The horizontal glazing support consists of both SHS and rectangular hollow section profile beams, spanning between the cantilever columns. Additional restraint to the compression flange of the cantilever columns has been required via localised diagonal stays at the connections. Given the glazed façades, cross bracing elements were not considered suitable and so structural stability is achieved via cantilever action of the perimeter columns on the loaded face, via sufficiently anchored moment resisting base connections. For the internal Market Stalls, the main structural frames typically consist of a single centralised cantilever column, with four primary cantilever roof beams extending to the four corners. Further secondary infill steelwork is supported off these beams to create the roof structure and to help subdivide the stalls. Commenting on the steelwork, Frank Whittle Partnership Architect John Bridge says: “Most of the steelwork will be exposed within the completed project, offering a unique juxtaposition between contemporary steelwork and traditional ironwork. Work on phase three began earlier this year and the project team anticipates completion sometime this winter, in time for the Christmas shopping season. Initial work included the installation of 25m-deep piles chosen because of the presence of made ground of up to 3.3m below ground level and cantilever nature of the perimeter columns. It was decided that shallow spread foundations, similar to the original Market Hall’s design, would not be practical or economical. Once the piles and holding down bolts had all been installed Border Steelwork Structures (BSS) was able to begin the steel erection programme. Contending with a sloping site – there is a 1.6m fall in ground level across the length of the structure – and the tight confines of the Market Hall, cranes were deemed to be unsuitable for this job. Any size of crane would have been too large to work within the Market Hall, and BSS was also very conscious of the recently renovated and repainted ironwork. Using a couple of MEWPs in conjunction with a telehandler, to perform all of the lifting operations, BSS erected the entire steelwork package in two weeks. Summing up, Conlon Construction Contracts Manager Terry Fisher says: “Close coordination between all of the different trades has been key to the continuing success of this project so far. Phase 1 – Completed May 2016 – Restoration on the Fish Market Canopy comprising refurbishment of the metalwork, redecoration and re-lighting. Phase 2 – Completed December 2016 – Restoration of the 1875 Market Hall Canopy to the same standard as the Fish Market Canopy. 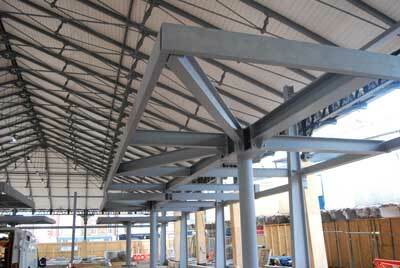 Phase 3 – On site – Building the new steel-framed indoor market hall under the restored 1875 Market Hall Canopy. Phase 4 – Demolition of current market hall and car park.